In a situation where both players castle on the same side, is it ever a good idea to charge the pawns in front of the castled king? Are there any rules for when you can do this? I know that generally those pawns shouldn't move. But I am also increasingly finding it useful in my games to break up my opponent's king's defensive structure by pushing up pawns. If I don't see any obvious attack on my position, is it worth it? Here is an example position from my previous game. I played h3, stopping a further knight advance and looking at pushing g4 to close off the black's light square bishop. But my deeper idea was always to push those pawns right up to open up black's king. To be honest though, I'm still not sure whether this was a good idea at all. The center is closed, and you can attack a "hook" pawn in your opponent's position by advancing one of your pawns before your opponent can break through in a meaningful way on the queenside. This strategy usually appears with the h-pawn attacking a kingside castled position with fianchetto, or with g5 (after a preparatory h5 to fix the opponent's h-pawn at h6), where he has not fianchettoed. The center is closed, and you can open a file for a heavy piece attack by advancing and sacrificing a pawn, usually the h-pawn, faster than your opponent can attack on the queenside. The center is closed, your opponent has no counterplay on the queenside, and you have occupied the e5 square with a pawn as White (e4 as Black), denying your opponent a knight position on f6 (f3). Typically, the g-pawn is the attacking pawn in this situation, though the h-pawn occasionally takes the stage. For examples, take a look at the English Attack against the Najdorf/ Scheveningen Sicilian, the Alekhine-Chatard Attack against the French, the Bayonet Mariotti Attack against the Pirc, etc. Note that the center must always be closed. In such types of positions, you should (as others have noted) play on the side containing your most advanced center pawn, i.e. in the direction they are pointing. So, in situations where both players have castled kingside, the center pawns will often be arranged d4-e5 for White, and d5-e6 for Black. Generally you should play on side where you have advantage in total firepower (P=1, N=3,...). In case of pawn storm in front of your king, the advantage should be bigger than you usually need. You can start easily minority attack with one extra horsie on the queenside, but you should probably not weaken your king seriously when you are just one knight stronger there. Edit: To make the rule about firepower complete, I would say your king is somewhere around -8 for these calculations while your opponent's around -3. Takes time to get close to him while your king is already weak. In this position I would play for b4. Good rule is that bishop g2 is very bad kingside attacker! is it ever a good idea to charge the pawns in front of the castled king? Are there any rules for when you can do this? What comes to mind first is King's Indian defence where Black attack on king's side (just as an example Gelfand - Nakamura, 2010). The rule is as usual: side attack could be met by center (or opposite side) counter-attack, so you need to make sure that your center and Queen side survive long enough without much protection. The best measure to achieve this is to close the center first. Attacking in front of castled kings will surely require from you to keep your rooks before your king too. And then the other side of the board will become absolutely unguarded. So when your opponent wins all the pawns on the other side he can just checkmate you by using his rooks or to create a passed pawn. On your diagram advancing g- and h-pawns by White looks like nonsense. The center is not closed, and even more than that, Black have more pieces on the King's side than White. So Black can easily meet your g4 by f5. Also moving just f- and g-pawns will be hardly sufficient to open Black's king. You need your f-pawn too. But black pawn on e5 is too strong for this to ever happen. This is common in many openings with an early f4/f5. 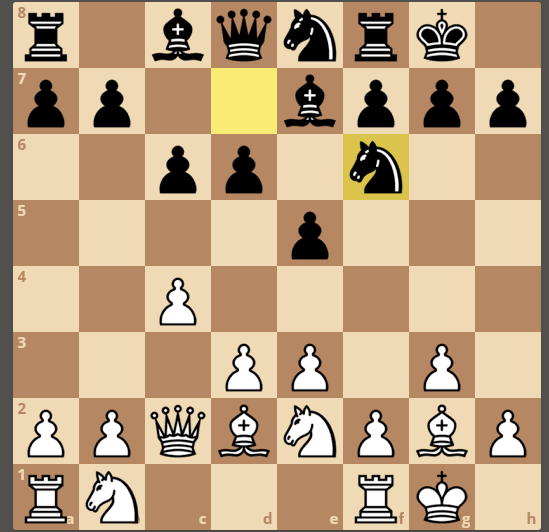 The Closed Sicilian, where white has pawns on c2/c3, d3, e4, f4 and g3, sometimes called "The Big Clamp"
The King's Gambit Declined, by transposition from the Bishop's Opening. One of white's plans here is to exchange off Black's dark squared bishop before castling, then playing f5 and initiating a pawn storm with h3, and g4. Personally, the set up I like for white is King's Gambit with a quick castle: pawns->g2 and h3, king->h1, and I think it offers more protection. the set up you have here doesn't allow for you to develop your pieces without losing your king's protection. Not the answer you're looking for? Browse other questions tagged pawns castling or ask your own question. Why is it a good idea to fianchetto above the castled King? If I do that, should I make sure to leave the Bishop there for a while to guard the hole? Why is castling king-side more encouraged than castling queen-side? When to decide King or Queen side castling?